DEERFIELD, Fla. (August 5`, 2013) – Acquinity Sports, under CEO Garry Jonas, has partnered with Hall of Famer Mike Tyson to form Iron Mike Productions, which makes its promotional debut August 23 with the presentation of the “Tyson Is Back!” event, in association with Greg Cohen Promotions, at Turning Stone Resort Casino in Verona, New York. “Tyson Is Back” will feature a World Championship doubleheader, airing live on the 2013 season ESPN Friday Night Fights finale. International Boxing Federation (IBF) super featherweight champion Argenis “La Tormenta” Mendez (21-2, 11 KOs) headlines in his first world title defense against Arash Usmanee (20-1, 10 KOs) in the 12-round main event. In the 12-round co-feature, undefeated Claudio “The Matrix” Marrero (14-0, 11 KOs) takes on Jesus Cueller (22-1, 18 KOs) for the vacant World Boxing Association (WBA) Interim featherweight title. “This is something I never anticipated,” Tyson said about promoting. “I’m very excited and looking forward to catering to the public. It’s really all about insuring a good night of boxing. I’m grateful to (Acquinity Sports CEO) Garry Jonas and Vice President of Boxing Operations) Henry Rivalta for welcoming me into the boxing promotions business with open arms. 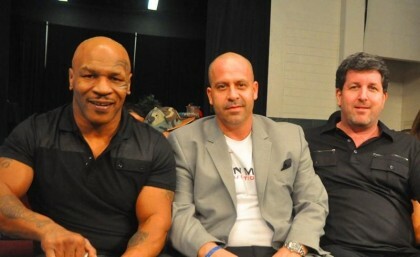 “We are very excited about partnering with Mike Tyson,” Iron Mike Promotions CEO Garry Jonas said. “He brings so much to the table. We are promoters; Mike’s already the best boxing promoter in the business because, when Mike talks, boxing people listen. Mike can bring more attention and exposure to a fighter than anyone else out there. With his continued success and rise as an entertainer, Mike’s progression into being a very successful promoter made a lot of sense. “I appreciate very much that Mike, his wife Kiki, and brother-in-law Azim, chose us to partner with. It validates the things we’ve been doing in boxing for the past two years, as well as the plans that we have. We plan on doing things differently. I think boxing fans and sports fans in general will appreciate what’s to come. Dominican Republic native Mendez, rated No. 2 in the world by The Ring Magazine, fights for the first time since he captured his IBF belt this past March, when he destroyed Juan Carlos Salgado (26-1-1) in a rematch culminating with a sensational knockout in the fourth round. Mendez now fights out of Miami. IBF No. 13-rated Usmanee, a native of Afghanistan who fights out of Montreal, is a five-time Canadian National amateur champion. The Greg Cohen-promoted challenger is a former North American Boxing association super featherweight and World Boxing Council (WBC) Continental Americas lightweight champion. Marrero, the WBA’s top-ranked featherweight at No. 2 (No. 1 unrated), is a stylish southpaw from the Dominican Republic who has defeated Emmanuel Lucero (DEC10), Fernando Wary Beltran (TKO3) and Mauricio Martinez (TKO4) in his last three fights. Argentine-invader Cuellar will be fighting out his native country for the first time as a professional. The 26-year-old, rated No. 4 by the WBA, is a former World Boxing Organization (WBO) Latino, Interim Fedalatin and Argentine featherweight champion. “This show is a great way to close out the 2013 season on ESPN Friday Night Fights,” added Henry Rivalta, COO Iron Mike Promotions. “I want to thank Brian Kweder (ESPN FNF programming director) for giving us this tremendous opportunity, as well as Turning Stone for hosting our new company’s first event. We’re going to put on an action-packed card, featuring some of the best up-and-coming talent in the world, who will be fighting in competitive, entertaining fights. Tickets priced at $150, $95, $55 and $45 go on sale today, Monday, August 5 at the Turning Stone box office, by calling (315) 361-7469, or visit www.Ticketmaster.com. Doors open at the Turning Stone Resort Casino Event Center at 6:00 p.m. ET, Friday, August 23. The first undercard bout starts at 7:00 p.m ET. The live ESPN2 telecast begins at 9:00 p.m. ET. For additional information go online at www.IronMikeProductions.com or www.TurningStone.com. Next boxing news: Coach Mike Kozlowsky: fight or die!